As I said earlier, I’ve given up writing about organic chemistry. If you’re expecting to read a post about concepts in organic chemistry you’ve come to the wrong place. This post, dear reader, is 100% about cats: cat science in particular. I just want to make that clear. Behold: a cat in my neighborhood. In the picture on the left, she’s lying down, whereas in the picture on the right, she’s sitting and scratching. She’s changed her shape, but you recognize her as the same cat. Why’s that? Beyond the fact that the markings are the same, we know intuitively that cats can move their limbs around – they have a certain freedom of movement. Depending on what they’re doing at the time, whether sleeping or scratching or looking out across the street, they’ll move their limbs to adopt different orientations. Look at this kitty: on the left, sleeping. On the right, standing on two legs. Same kitty, but what’s different? In my first foray into cat science, I’ll argue that the difference is comfort. This is the same cat, but the shapes have different comfort levels due to the impact of gravity (among other things). The orientation on the left is more comfortable, hence lower energy, and the orientation on the right is less comfortable, hence higher energy. Let’s give these shapes a name. Since we’re talking about comfort, here, I dunno – let’s call them, say, “conformations”. 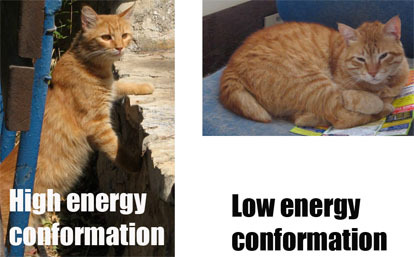 Conformations: the different shapes a cat can make by moving its limbs around, achieving different levels of comfort. Here’s two more pictures of cats in my neighborhood. Now is THIS the same cat? No way – kitty on the left is normal whereas the one on the right looks like it paid a visit to the Island of Dr. Moreau. Unlike conformations, which can be interconverted by movement of the limbs, here the connectivity is different. The leg and tail are switched. No matter how they move, they cannot interconvert. The limbs are in a different configuration. However, they *are* similar. 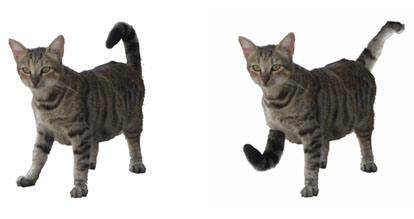 If we did some (very morbid) major surgery but if we just switched the leg and the tail back, we’d clearly obtain the same cat. In other words, their constitutents – that is to say, their limbs – are the same, but arranged in different orders. Let’s go out on a limb and call them constitutional isocats. 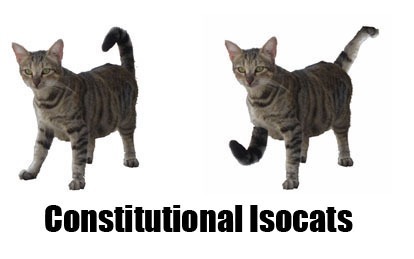 Constitutional isocats: Cats that have the same constituents, but differ in the order in which they are connected. By switching around the limbs on a given cat, we obtain different configurations. So in a nutshell: conformations can interconvert, but configurations can’t be interconverted without breaking off body parts and moving them around. Some people might point out that “conformations” and “configurations” are also concepts in organic chemistry that mean much the same thing, and that this post is a thinly disguised effort to teach concepts in organic chemistry through a discussion of cats. Horseshit. This is 100% cat content here people! This is a cat blog. In our next foray into cat science, we’ll break new ground by doing a more thorough analysis of feline conformations. This is excellent! Keep it up. “Stats with Cats” ! Great idea! The utility of cats in science is exceedingly useful. I’m sure that Schrodinger would approve. If I had a dollar for every spectrum of “molecule poop” I’ve taken…. Are you sure it is “conformations” and not “comfortations”? 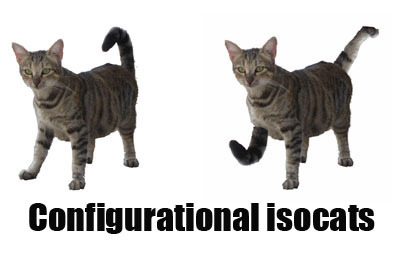 Unfortunately, the cats labeled as Configurational Isocats, are not configurationally isomeric. They are constitutionally isomeric. When you switch a tail with a front leg (see Chemical & Engineering News, Dec. 20, 2010, page 56), you get a constitutional isomer or the original. Crap. Thank you very much for the correction. I love your post, what a great way to get some difficult concepts across to young readers (or to those that think the concept of symmetry is boring). I personally have four cat-symmetry studies going on right now. 7 constitutional casts for me. They are always right and I am in the minority in the House. I am reminded that energy can be neither created nor destroyed, only its form changed. Cats are very good at that. I may accidentally have learned something about organic chemistry, but I really like the Cat Science. 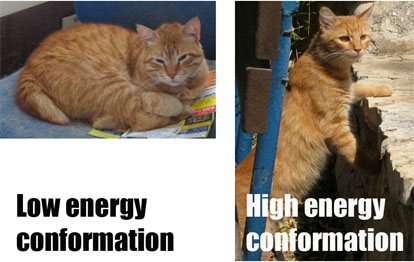 I was wondering, do cats take a high energy conformations when it s sunny and hot, and a low energy conformations when things cool down? – just wondering? It’s a sinusoidal distribution… low energy conformation below 15 deg C, then high energy conformation up to 30 deg C or so, and then back down to low energy conformation above that. very curious, someone should study it in more detail. I dont like cats or organic chemistry. You’re on your way to change my mind.. I meant to write cats, not casts. lazy finger this morning. There is a cat conformorating to my mouse. I’ve no idea how I landed on your blog, but an hour later I’m still reading. Good stuff this cat / chemistry combo :-) You’re funny. You sir, are one amazing teacher! Your creativity and and skill to deliver boring and complicated stuff in an easy fun manner is flabbergasting! I LOVE this site, I am an AS chemistry student and I absolutely used to hate the words organic chemistry, my head always hurt when I spent a lot of time studying it and then forgetting everything the next day UNTIL I read you posts and everything just clicked! my understanding is much better and so is my memory and instead of my head hurting I am actually having fun. THANK YOU SO MUCH!! OMG Amazing ! Thank you, I am always getting these all mixed up, i know the concepts but mess up the labelling of them, getting the names all mix mashed. Now I will never forget them. As a high school student who already loves the beginnings of organic chemistry… without a doubt I have definitely been motivated pursue organic chemistry in university now. Wait this isn’t organic chemistry? Okay, I’m just going to buy more cats then. I haven’t finish reading the post yet, but I have to say, wow, how did you come up with this? This is so amusing! Thanks for saving my orgo mark! This post should come with a health warning. But I do believe I’ll stop laughing in a couple of months or so! correlated to polymer molecules. I loved your ideas. What would be meant by configurational isocats…. You say configuration can’t inter convert, does it constitutional isomers or configurational isomers…..